The news of the arrests of more than fifty Human Rights activists throughout the entire country has only further confirmed the violent nature of the regime which governs my country. Some people had illusions. Once again, those detained and beaten in their own homes were peaceful dissidents and their families. No voluntary actions, little solidarity among neighbors, and a great wave of fear which can be seen on the faces of people. It is a profound fear which “inspires even further fear. “The arrests began during the early morning of February 21st, when activists from the Eastern Democratic Alliance, Francisco Luis Manzanet Ortiz, Omar Wilson Estevez Real, Annie Sarrion Romero, her husband Juan Carlos Vazquez Osorio, and Milagros Leyva were all taken to a police unit in the Villa Primada in Baracoa. From this group, Manzanet Ortiz and Estevez Real remained detained until the 24th. The main goal of the pro-Castro soldiers which guard the gardens of the Plaza of the Revolution was to prevent any tributes to Orlando Zapata Tamayo to take place on the 1st anniversary of his death on the 23rd of February, as well as tributes to the shot down pilots of “Brothers to the Rescue” on the 24th. 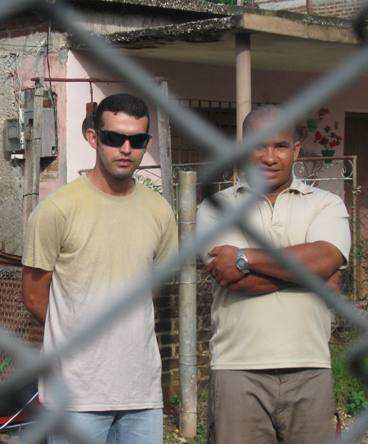 As usual, the homes of human rights activists, other dissidents, and independent journalists from Santiago de Cuba, Guantanamo, and Holguin were all extensively watched over by the combined forces of the political police (G2), the National Revolutionary Police, and the paramilitary Rapid Response Brigades. On the 21st, in fact, the independent Baptist pastor, Desmides Hidalgo Lopez, was brutally beaten by members of State Security in the town of Buenaventura, Holguin. While I was writing these paragraphs, Desmides had already been released but his house was surrounded by soldiers. On the night of February 22nd, I received a call from Yanet Mosquera Cayon. She was telling me that her husband, Rolando Rodriguez Lobaina, the general coordinator of the Eastern Democratic Alliance, and other dissidents had been detained in the streets of Guantanamo.On the 23rd of February, after a strong military deployment, Reina Luisa Tamayo was able to visit Zapata’s tomb in the cemetery of Banes, but only with 11 other family members. On the morning of that same day, Jorge Corrales Ceballos, Jose Cano Fuentes, and Isael Poveda Silva (all from the Eastern Democratic Alliance), were detained in Guantanamo. According to the testimonies of ex-political prisoner Fidel Garcia Roldan, in Holguin political police agents began to beat the journalist Maria Antonia Hidalgo, her mother Maria Mir, and the activist from FLAMUR, Marlene Pupo Font. Caridad Caballero Batista, her husband Esteban Sande Suarez, and pro-democratic activist Juan Carlos Gomez, were also all beaten in this eastern city. Other arrests occurred in Palma Soriano. Raudel Avila Losada confirmed arrests of nearly 30 activists all of which, according to his testimony, were released in less than two hours. On the morning of February 24th, Avila Losada confirmed that Cauto Marino Antomachin and Reinaldo Martinez Rodriguez were still detained in that Santiagan city on the banks of the Cuato river. 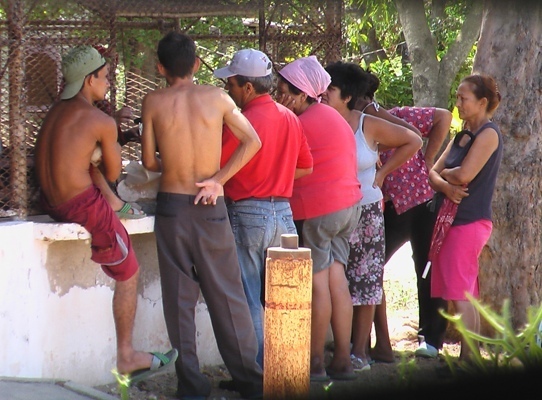 Restrictions of movement, with special orders preventing dissidents from leaving their own homes, were confirmed in Antillas, Banes, San German, and Santiago de Cuba. In the latter (Santiago), there were reports of arrests of various dissidents in the town of El Caney, without having a clear figure of who they were or how many there were, because they were all detained while on their way to another point of the city. Idalmis Nunez Reinosa was in her home, but her telephone line would constantly drop. I also received news that Antunez, just like Idania Llanes and others, also suffered arrests. The home of Antunez was also attacked by Castro forces. From Havana, where I am currently writing this post, a neighbor of the independent journalist Hector Julio Cedeno Negrin tells me that Hector did not return to his house after an opposition activity which took place on Neptune Street outside the house of Laura Pollan Toledo. Cedeno Negrin was beaten and still remains detained. I have been able to write this short report after calling the few phones which had not yet been disconnected. It is the 24th of February and I do not want to wait until tomorrow to post a partial report. Surely, today there will be more arrests if any dissident goes near the ocean to toss some flowers in memory of the fallen Brothers to the Rescue. I am writing in haste because I am being followed. My wife tells me that far away in San German there have been troops stationed around my house for more than 24 hours. She does not know if the purpose of this is to detain me upon my arrival, or because they are not sure whether I am inside. Here, in the streets of Havana, I see a tense calm. But I walked to the cybercafe and went ahead and sent this post. This time I have avoided walking into the trap of my captors in order to send out some tweets with the little credit I have left in my cell phone, and to write up this note for all of you. I fear that there will be a fight in the afternoon if they try to detain me. Fellow activists and dissidents have asked me to send them messages through my cell phone. They all want news of what happens.I also had the illusion, or the dream, of Egyptian or Libyan streets lit up at night, of that same sound of the people’s demands which filled the middle-Eastern desert air. But the Cuban reality is different. There have been arrests and beatings, and there are fewer of us than those who filled the plazas of Cairo to demand freedom. It is now one year since the death in prison of Orlando Zapata Tamayo, His death from the effects of a prolonged hunger strike was widely reported by the international media. A year later the body of this young black man has provided an excuse to extend the repression to his brothers in the cause, to those who sympathized with him though they didn’t know him, and to a large number of people who have seen their neighborhoods surrounded by hordes of police encircling peaceful dissidents. The fact that Zapata’s death came about through starvation is one more piece of the hunger we have endured for over half a century. I speak of the spiritual hunger for the lack of freedom and the other, which hurts in one’s own body. I speak of the lack of food for a people because of the government’s apathy and lack of actions to meet our minimum needs. That is the paradox, that is the legacy. When millions of Cubans wrack their brains every day to find something to eat, a man without freedom such as Orlando Zapata Tamayo decides to starve to death rather than to continue being humiliated and severely beaten in prison, where he was. 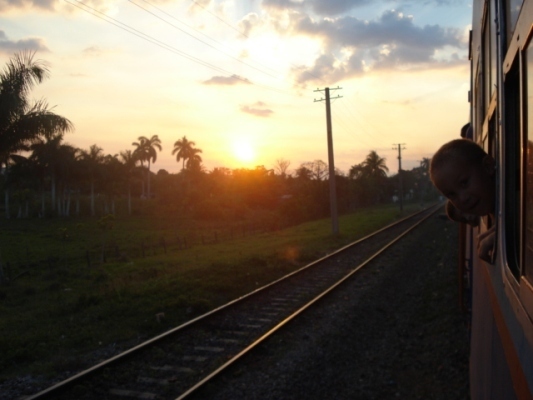 The acts of being black, a dissident, and from eastern Cuba were other sentences that carried him to his final torture. Discriminated against because of the color of his skin, like thousands of Cubans in this era of “equalities,” he refused to believe in this veiled, but latent, apartheid. Pro-government academics and intellectuals have made their thoughts known about racism in Cuba, on that there’s no doubt. A law approved in 1997 prohibits and regulates those from “the interior of the country” from taking up residence in “the capital of all Cubans,” and so his punishment was threefold. One day in the summer of 2009, I was stationed in front of the Holguin provincial prison in solidarity with Zapata on one of his hunger strikes. Eight months later, on 3 February 2010, I marched with thirty dissidents through the streets of Camaguey, and was outside the hospital where the black Zapata lay dying in his penultimate battle. The arrests for when I have tried to reach his native Banes, the days when my house has been surrounded by hordes of plainclothes and uniformed police to keep me from leaving and which have required my son to undergo psychiatric treatment, are an extension of Orlando Zapata Tamayo’s body. The metaphor of the body in the body of another is not a pennant, a medal worn as a trophy of war, it is the consequences of the dream of freedom. Hundreds of arrests have occurred in the space of a year. But the attempt to publicly humiliate him, using all the mass media under the government’s control, has not been enough to silence this simple and civic act of planting oneself firmly in opposition to the dictator. The rebellion of the Ladies in White, the hunger strike of Guillermo Farinas, the stubborn decision of hundreds of Cubans to seek freedom, have proved that his death was not in vain. The clumsiness of the authorities in blocking those who want to go to Banes, to freely visit the cemetery, a place of national pilgrimage, is part of the extension of the body of Orlando Zapata Tamayo who is all of us. With seventy-five years on his back Leslie Chan never imagined he would take his bones to a police station. Barely a week ago he was sitting on a public bench waiting for some friends to have a little chat as he does every morning since he’s been retired, but a police officer interrupted the day. When they clarified it and explained to him that it was his “civic duty” he repeated what he said and added that he’s retired, he suffers from high blood pressure, and added other excuses for what he would consider being an “accomplice” to the search. The police asked for his identity card and spit out that he could look for it at the town police station. I am a witness to the fact that for four days he went, helped by his sister, also in her seventies, to the police station to look for his ID card. Every time the clerk explained that it was true he had a right to claim it, and even the head of the military post told him that when the uniformed officer returned he would be reprimanded. Still unknown is if there was actually a fine but he’s sure of what he knows very well and that is according to the Cuban penal code no one is obliged to attend a home search as a witness unless it is “a question of life and death.” And in this case it was just about “looking for some bills in Cuban convertible pesos” in the house of dealer so that requirement does not apply to this seventy-five year old. Leslie flatly refused, like Rosa Parks he clung to the truth. As she did, grabbing onto the bars of her bus seat, Chan refused to cooperate with an absurd policy. It is a gesture, a small action like those that set off any social revolution. There is no way the Cuban government is noted for civility and good manners in sharing the country, the land, the public space with its peers, though they be adversaries in the social or political arena. For several years, over her, as the level of civil disobedience grows, the repressive forces, propping up the unsalvageable, prohibit any public act, any gesture of public participation and the popular imagination has fabricated the idea that the “the streets belong to the revolutionaries,” or “this street belongs to Fidel,” as some of the partisans and those sent to repudiate dissidents scream. To place flowers on Marti’s monument, a wreath on the statue of Martin Luther King, Gandhi or Lincoln, becomes a suicidal act ending in beatings, taunts and arrests that last from hours to days. 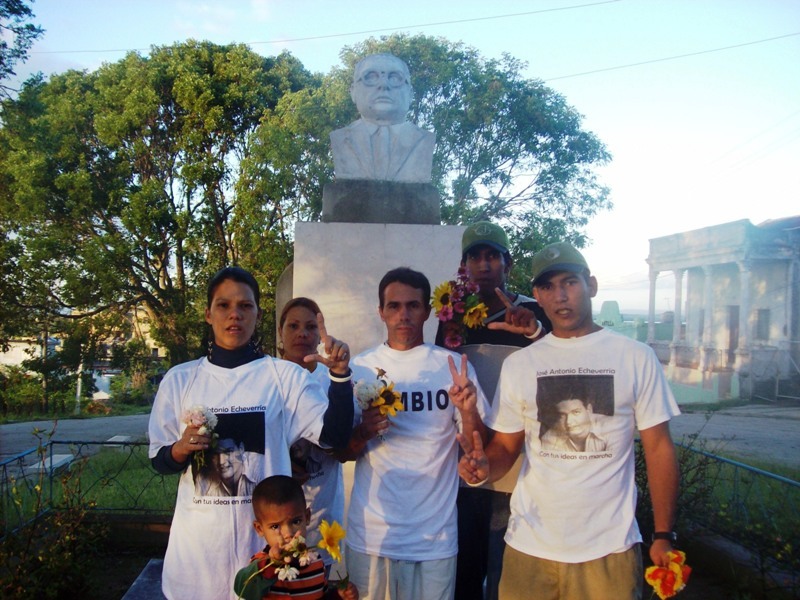 The recent twenty arrests in the east of Cuba when the distinct independent civil society groups tried to commemorate the birth of Jose Marti last January are the most recent proof. The public space has been usurped in the name of national security, on the pretext of maintaining public order, leading to beatings and arbitrary detentions. Public space and civic action are hostages of a law is a dead letter, but needs more voices claimants. The scenario is there. The massive layoffs so frequently announced by the Cuban nomenclature have not yet been implemented, but we can already see some of the first effects. Despite the initial impulse of those who have seen an incentive, escape, or “breath of oxygen” in this, others have decided to “take justice into their own hands”. The absence of labor options, and the economic incentives, has actually really gotten to some people, and everyone has thought up something different. So far during this new year, there have been a few robberies in some grocery stores, warehouses, and other public service businesses in the city of Holguin. In San German, a series of robberies left a couple of other grocery stores empty. They took the oil, the coffee, and nearly all the rice. All these products belonged to the “basket of basic goods” category, or in other words, they were products monitored by the rationing cards. Now, people do not hesitate one bit when they see 4 ounces of chicken or some kind of “texturized” ground beef (as it’s called here). They immediately go to buy any such products. “Just in case they run out fast,” someone–who nowadays is one of the first people in line whenever products arrive to the local grocery shop–commented to me. The products mentioned in the Rationing Card are few and seldom available (only once a month), and the distribution company gets caught up, and one day the oil comes in, the next the soap arrives, and then the following week is when the coffee would arrive. The incursions of the burglars go from the most basic thefts, with the usage of crowbars and pliers, to the sophisticated use of lock picks. In some places, they have left behind some messages warming that what was happening was only the beginning of much more to come. In other cases, these messages point out the negligence displayed by those in power. The unfortunate fact about this is that we are now witnessing a wave of theft which, on the one hand, puts many innocent people at risk, while on the other hand it serves as a “mirror”, as the only way of being able to achieve what one wants. Robberies in local grocery stores are the reflection of thievery taking place in the high ranks, where men with white collars have amassed personal fortunes, and when this was not enough for them anymore they decided to stick their hands in the coffers of “Father State”. “The General’s men are the ones who are robbing”, a street corner know-it-all tells me, while adding, “Nobody robs 6 millions dollars from the local shop, and nobody asks to borrow 2 airplanes to later return them. In order to do any of that, one must be up in the high ranks,” he reassures me. So far, during this new year the expectation of massive layoffs has increased, and along with it so too the decisions of various people I know to enter the private sector as self-employed workers, whether it be setting up a small shop or becoming agricultural workers for farmers. However, around here it is a fact that the “re-organization of the surplus labor force” has been held back “until April” (which curiously coincides with the long-awaited congress of the Communist Party). There are already signs of what’s to come, what has been set in motion by the current prevailing malaise.